One in seven Americans has had some form of CPR training, and yet, of the approximately 350,000 people who suffered cardiac arrest outside of a hospital in 2016, less than half were lucky enough to receive CPR from a bystander, leaving them with just a 12% chance of survival. A recent American Heart Association study into why so few people are willing to perform CPR identified a number of factors: risk aversion, an unwillingness to perform mouth to mouth, and worry about hurting the victim, but by far the most prevalent was a lack of confidence in their ability to identify what was wrong with the victim. Here at Northwest Career College, we know the value of CPR. The chances of surviving a cardiac arrest are doubled or even tripled if the victim receives CPR from a bystander, even one with no prior medical training, which is why we offer free CPR classes to all our students. And to make things even clearer, here are the differences between the two most common causes of cardiac arrest: sudden cardiac arrest and a heart attack. Inside everyone’s heart is a biological pacemaker called the SA node that produces the electrical signals that cause the chambers of the heart contract and release, causing blood to pump at regular intervals. While the heart rate can speed up or slow down, the SA node makes sure it always keeps a steady pace in order to ensure proper blood flow and pressure. A sudden cardiac arrest occurs when there is a malfunction in the heart’s electrical system, causing the heartbeat to become irregular. This disrupts the flow of blood to the vital organs, including the victim’s brain. Victims of sudden cardiac arrest lose consciousness suddenly, have no pulse, and will die or suffer serious brain damage within minutes if the condition is not treated. Sudden cardiac arrest often happens with no warning, but it can be brought on by severe blood loss, drowning, drug overdose, asphyxia, or major physical trauma. How Do You Treat Sudden Cardiac Arrest? Sudden cardiac arrest should be treated by immediately calling 911 and starting chest compressions. Sudden cardiac arrest is so deadly because, without a heartbeat, the brain loses its supply of oxygenated blood. The brain cells of a cardiac arrest victim start dying within approximately four minutes of losing blood flow and each minute afterward the chances of restoring those brain cells are reduced by around 10%. 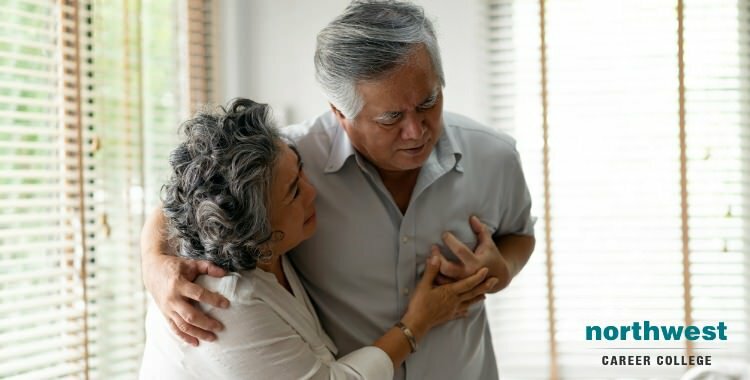 While sudden cardiac arrest and heart attacks are often confused with each other and may have similar symptoms, they have very different causes. A heart attack occurs when the flow of blood to the heart is stopped by a blockage. If the blockage is not removed, the part of the heart that receives blood from the blacked artery will start to die. Pressure, tightness, pain, or a squeezing or aching sensation in the chest or arms that may spread to your neck, jaw or back. Nausea, indigestion, heartburn or abdominal pain. Heart attacks are often caused by a condition called atherosclerosis, in which plaque builds up in the arteries due to high levels of cholesterol in the blood. They can also be brought on by severe dehydration, drug abuse, extreme pain or emotional stress, and exposure to extreme cold or heat. How Do You Treat A Heart Attack? One of the main differences between a heart attack and sudden cardiac arrest is that the symptoms of a heart attack may develop more slowly, sometimes over several days, and the victim does not always go into immediate cardiac arrest. If the victim shows signs of having a heart attack, your first step is always to call 911. If the victim has yet to lose consciousness, you can try and forestall a potential cardiac arrest by giving the victim one 325 milligram aspirin to chew and swallow. Aspirin acts as a blood thinner that can help break up the blockage that is causing the heart attack. If the victim has a history of cardiac issues they may also have been prescribed cardiac medication, such as nitroglycerin, which can also be used to prevent cardiac arrest. Heart attack victims do not need to immediate CPR and you should not start to perform CPR if the victim is still breathing and still has a pulse, even if they have lost consciousness. If at any point the victim stops breathing or you can’t find any evidence of a plus, being chest compressions immediately and continue them until the emergency services arrive.